TURN TO PAGE 12 TO MEET THE WINNER OF AGPITCH18! Brian Boyd grew up on a farm in Lebanon, Pennsylvania, providing the basis for his role as Vice Chairman of our Board. Jenny Rhodes of Centreville, Maryland has dedicated her life to serving the agriculture community, including her role as Chair of our Board. ating a farm and market in Gettysburg, Pennsylvania, Paul Baumgardner has served on our Board for 14 years. Serving on his farm in Winchester, Virginia and on various committees and boards, such as ours, comes naturally to Joe Snapp. WANT TO RECEIVE THE LEADER VIA EMAIL? Send a message to Katie Ward at kward@mafc.com to join the list! Our fourth quarter issue will be distributed by email only. If you have any questions or ideas for the editorial staff of the Leader, contact Katie Ward at 888.339.3334, email her at kward@mafc.com or write her at MidAtlantic Farm Credit | 45 Aileron Court | Westminster, MD 21157. This publication is for you, our reader. We’d love to hear from you! 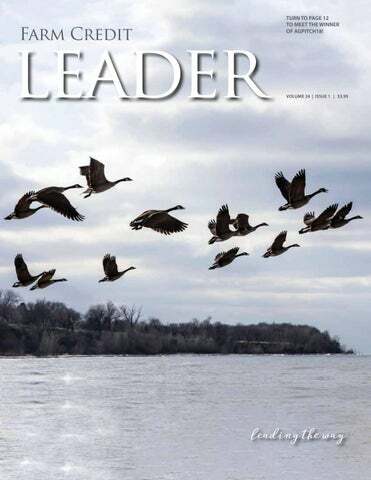 The Leader is published quarterly for stockholders, friends and business associates. If you wish to no longer receive this publication, please email: unsubscribe@mafc.com. Use “Unsubscribe Leader” in the subject. 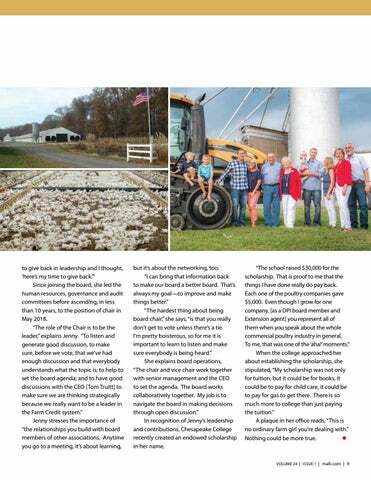 EXPERIENCE IN THE AG WORLD AND COMMUNITY INVOLVEMENT PROVIDED THE BASIS FOR ONE OF MIDATLANTIC FARM CREDIT. THE BOYDâ&#x20AC;&#x2122;S PRIDE IN AGRICULTURE IS REFLECTED IN EVERY ASPECT OF THEIR FARM, FROM TRACTORS AND EQUIPMENT TO BUILDINGS AND THEIR FARMSTEAD. FOR THOSE NOT DIRECTLY INVOLVED IN AGRICULTURE, SEEING A WELLKEPT FARM IN THE COMMUNITY IS A GREAT AMBASSADOR FOR AGRICULTURE. BRIAN SAYS THE FARM CREDIT SYSTEM PROVIDES OUTSTANDING TRAINING WITH SPEAKERS WHO GIVE INSPIRATION AND GUIDANCE, AND HE TAKES WHAT HE HAS GAINED TO HIS FAMILY, FARM OPERATION, AND CHURCH. SERVING ON THE BOARD IS A WAY FOR BRIAN TO GIVE BACK TO BOTH LOCAL AND NATIONAL AGRICULTURE COMMUNITIES, AS WELL AS FARM CREDIT STOCKHOLDERS. THESE DESCRIPTIONS: STRONG COMMUNICATION, PASSION AND COMMITMENT, POSITIVITY, AND COLLABORATION. you feel like you’ve known him for years. MidAtlantic Farm Credit’s Board of Directors. the board to be positive and innovative. TO T H E F U T “We always went to these ‘learning N I G N has served as Chairman of the Usessions’ , and I would come back to my interest he took in each visitor crossing the Y I Paul R L E F own business pumped up and ready Board of Directors, Vice Chairman, and market’s threshold. to apply what I had learned,” he shares. invested in the operations of the market. “I milked cows for some time,” he explains. CANDY BOOTH. VISIT THEIR WEBSITE AT HARVESTBARNCOUNTRYMARKET.COM FOR A LIST OF VENDORS AND PRODUCTS OFFERED. 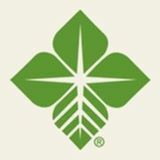 members on the Farm Credit board. also offer this type of resource to customers. are,” claims Paul, referring to the market. when it comes to business decisions. WIFE RACHEL HAVE A SON OLIVER AND ARE EXPECTING A NEW ADDITION. JENNY’S PARENTS, TEMPLE AND PAT RHODES, OPERATE CHESTNUT VALE FARM LANE FARM. SAYS JENNY RHODES, CURRENT CHAIR OF THE MIDATLANTIC FARM CREDIT BOARD OF DIRECTORS. REFERRING TO HER MANY ROLES IN MARYLAND AGRICULTURE, JENNY COULD HAVE ALSO BEEN DESCRIBING HER ENTIRE LIFE—EMPHASIZING AGRICULTURE FROM HER CHILDHOOD TO HER CURRENT FULL PLATE OF ACTIVITIES AND RESPONSIBILITIES. She has been on the Delmarva Poultry Industry board for many years, serving as President in 2012 and currently serves on the executive committee. In 1997, she joined Queen Anne’s County Extension. Now as a senior agent, “I focus on agronomy, poultry, and risk management, and under that comes women in agriculture.” Jenny is proud of Annie’s Project, an Extension program created to empower women in agriculture to develop networks and skills. In 2006 she graduated from LEAD Maryland. LEAD Maryland fellowships focus on public issues, education, skills building, and leadership development. but it’s about the networking, too. “I can bring that information back to make our board a better board. That’s always my goal—to improve and make things better.” “The hardest thing about being board chair,” she says, “is that you really don’t get to vote unless there’s a tie. I’m pretty boisterous, so for me it is important to learn to listen and make sure everybody is being heard.” She explains board operations, “The chair and vice chair work together with senior management and the CEO to set the agenda. The board works collaboratively together. My job is to navigate the board in making decisions through open discussion.” In recognition of Jenny’s leadership and contributions, Chesapeake College recently created an endowed scholarship in her name. REVEALED IN DECADES OF FAMILY MENTORS. 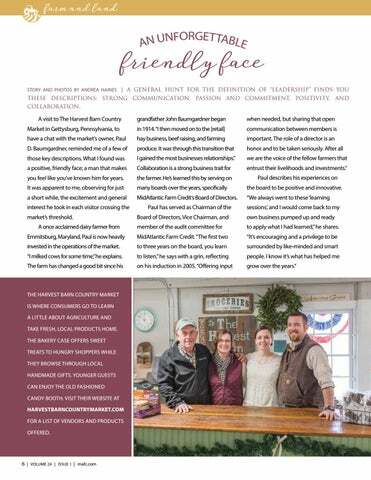 FOR THE SNAPP FAMILY OF WEST OAKS FARM IN WINCHESTER, VIRGINIA, THE OPPORTUNITY TO “STEP UP TO THE PLATE” HAS BEEN WELCOMED AND FRUITFUL. is apparent, signs of a close-knit family, but are “all business” when it comes to talking agriculture. knowledge he’s accrued over the years. everything with their kids,” says Levi. various leadership roles,” shares Levi. the procedures and changes,” adds Joe. us to choose our own path,” shares Ben. 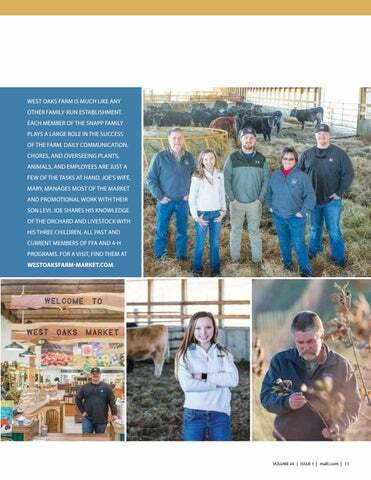 WEST OAKS FARM IS MUCH LIKE ANY OTHER FAMILY-RUN ESTABLISHMENT. 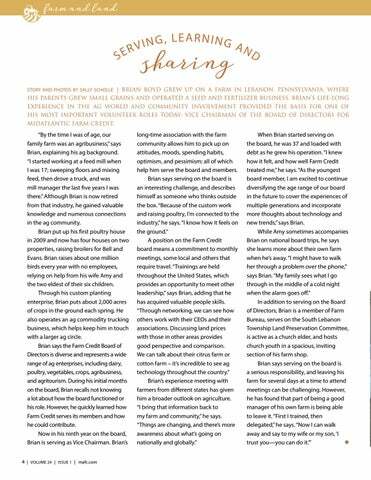 EACH MEMBER OF THE SNAPP FAMILY PLAYS A LARGE ROLE IN THE SUCCESS OF THE FARM. DAILY COMMUNICATION, CHORES, AND OVERSEEING PLANTS, ANIMALS, AND EMPLOYEES ARE JUST A FEW OF THE TASKS AT HAND. JOEâ&#x20AC;&#x2122;S WIFE, MARY, MANAGES MOST OF THE MARKET AND PROMOTIONAL WORK WITH THEIR SON LEVI. JOE SHARES HIS KNOWLEDGE OF THE ORCHARD AND LIVESTOCK WITH HIS THREE CHILDREN, ALL PAST AND CURRENT MEMBERS OF FFA AND 4-H PROGRAMS. FOR A VISIT, FIND THEM AT WESTOAKSFARM-MARKET.COM. 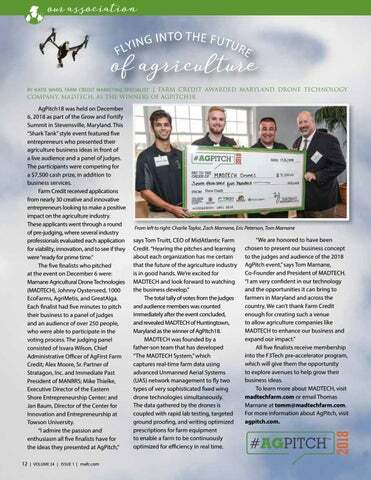 BY KATIE WARD, FARM CREDIT MARKETING SPECIALIST | FARM CREDIT AWARDED MARYLAND DRONE TECHNOLOGY COMPANY, MADTECH, AS THE WINNERS OF AGPITCH18. says Tom Truitt, CEO of MidAtlantic Farm Credit. “Hearing the pitches and learning about each organization has me certain that the future of the agriculture industry is in good hands. We’re excited for MADTECH and look forward to watching the business develop.” The total tally of votes from the judges and audience members was counted immediately after the event concluded, and revealed MADTECH of Huntingtown, Maryland as the winner of AgPitch18. MADTECH was founded by a father-son team that has developed “The MADTECH System,” which captures real-time farm data using advanced Unmanned Aerial Systems (UAS) network management to fly two types of very sophisticated fixed wing drone technologies simultaneously. The data gathered by the drones is coupled with rapid lab testing, targeted ground proofing, and writing optimized prescriptions for farm equipment to enable a farm to be continuously optimized for efficiency in real time. “We are honored to have been chosen to present our business concept to the judges and audience of the 2018 AgPitch event,” says Tom Marnane, Co-Founder and President of MADTECH. “I am very confident in our technology and the opportunities it can bring to farmers in Maryland and across the country. We can’t thank Farm Credit enough for creating such a venue to allow agriculture companies like MADTECH to enhance our business and expand our impact.” All five finalists receive membership into the F3Tech pre-accelerator program, which will give them the opportunity to explore avenues to help grow their business ideas. To learn more about MADTECH, visit madtechfarm.com or email Thomas Marnane at tomm@madtechfarm.com. For more information about AgPitch, visit agpitch.com. course for the future of our organization and agriculture as a whole. We want to celebrate each and every one of you who work hard to protect the lifestyle we all love and educate others on the importance of agriculture! 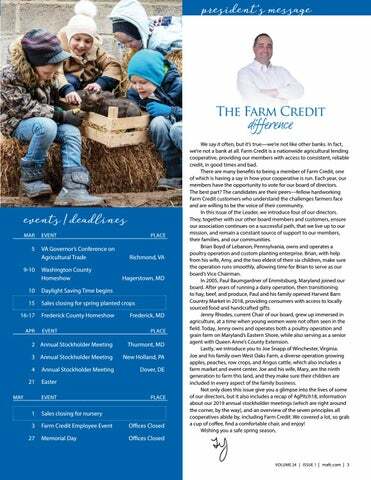 Please join us at the location nearest you to meet fellow agriculture community members, including Farm Credit staff and directors, for some great food, and to learn what your association has planned for the upcoming year. All of those who attend can enter to win a 2018 John Deere Gator, and have the chance to win some really fun door prizes. TWO WAYS TO REGISTER Visit mafc.com/annual-meetings and complete the online registration form by March 22. Fill out and mail back the RSVP postcard in your annual meeting information statement, which you will be receiving soon. INSIGHT INTO THE CHALLENGES AND OPPORTUNITIES THAT ARE AHEAD IN THE AGRICULTURE INDUSTRY. WHAT STRATEGIES WILL INDIVIDUALS AND ORGANIZATIONS NEED TO IMPLEMENT TO PREPARE FOR PROACTIVELY MANAGING AND CAPITALIZING ON ECONOMIC MEGATRENDS? WHILE THIS SUBJECT COULD FILL A SEMESTER OF LECTURES IN A UNIVERSITY CLASS, LET’S FOCUS ON A FEW KEY ASPECTS. VOLATILITY Historically, the agriculture industry has been required to navigate business operations in a volatile environment. The future leader will be confronted with extreme volatility in an economic environment of smaller margins. During the economic commodity super cycle from 2006 to 2012, high commodity prices were the norm, making it easier for producers to more easily absorb fluctuations in prices and cost. However, with today’s suppressed margins, the ability of a leader in the agricultural field to execute a well-managed game plan will be a requirement, not an option. In the future, these leaders will have to integrate changes in currency values and the impact of foreign and domestic trade negotiations into both short- and long-term strategies. INTEREST RATES The agriculture industry has experienced a decade of low, flat interest rates. In the next few years, agriculture leaders must manage debt and capital in an environment of increasing interest rates. These rising rates, coupled with tighter margins, increase the emphasis on financial sensitivity analysis of cash flows, overall debt structure and repayment terms. Special emphasis must be placed on working capital and overall capital management to absorb occasional negative changes in profits as a result of price, cost or interest rate variability. This will be the buffer for adversity, but also the catalyst for opportunity and change. will employ a combination of both marketing strategies. PEOPLE People management will be the differentiator of business performance in the future. Independent leadership will be replaced by individuals who are interdependent and can build a productive work and business culture of high-performing employees and customers. As younger generations move toward technology, maintaining the balance between interpersonal skills and technology will be a challenge. Future business leaders must embrace the confluence of these skills as an opportunity. Many economic megatrends will impact the future of the agriculture industry. Volatility can result in opportunities, but it also can result in failure if not managed proactively. Interest rates will impact the cost of doing business and asset values. Consumer trends will require constant research and assessment. People management will continue to be an important business skill. There is a bright future for the agriculture industry when its leaders embrace these changes. If you have questions or just want to “talk shop”, give us a call at 888.339.3334 or visit mafc.com! 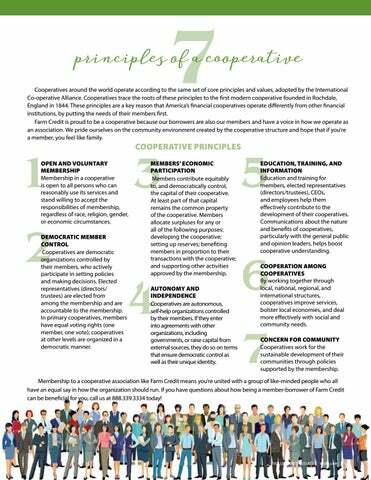 principles of a cooperative Cooperatives around the world operate according to the same set of core principles and values, adopted by the International Co-operative Alliance. Cooperatives trace the roots of these principles to the first modern cooperative founded in Rochdale, England in 1844. These principles are a key reason that America’s financial cooperatives operate differently from other financial institutions, by putting the needs of their members first. Farm Credit is proud to be a cooperative because our borrowers are also our members and have a voice in how we operate as an association. We pride ourselves on the community environment created by the cooperative structure and hope that if you’re a member, you feel like family. OPEN AND VOLUNTARY MEMBERSHIP Membership in a cooperative is open to all persons who can reasonably use its services and stand willing to accept the responsibilities of membership, regardless of race, religion, gender, or economic circumstances. DEMOCRATIC MEMBER CONTROL Cooperatives are democratic organizations controlled by their members, who actively participate in setting policies and making decisions. Elected representatives (directors/ trustees) are elected from among the membership and are accountable to the membership. In primary cooperatives, members have equal voting rights (one member, one vote); cooperatives at other levels are organized in a democratic manner. MEMBERS’ ECONOMIC PARTICIPATION Members contribute equitably to, and democratically control, the capital of their cooperative. At least part of that capital remains the common property of the cooperative. Members allocate surpluses for any or all of the following purposes: developing the cooperative; setting up reserves; benefiting members in proportion to their transactions with the cooperative; and supporting other activities approved by the membership. AUTONOMY AND INDEPENDENCE Cooperatives are autonomous, self-help organizations controlled by their members. If they enter into agreements with other organizations, including governments, or raise capital from external sources, they do so on terms that ensure democratic control as well as their unique identity. EDUCATION, TRAINING, AND INFORMATION Education and training for members, elected representatives (directors/trustees), CEOs, and employees help them effectively contribute to the development of their cooperatives. Communications about the nature and benefits of cooperatives, particularly with the general public and opinion leaders, helps boost cooperative understanding. COOPERATION AMONG COOPERATIVES By working together through local, national, regional, and international structures, cooperatives improve services, bolster local economies, and deal more effectively with social and community needs. CONCERN FOR COMMUNITY Cooperatives work for the sustainable development of their communities through policies supported by the membership. Membership to a cooperative association like Farm Credit means you’re united with a group of like-minded people who all have an equal say in how the organization should run. If you have questions about how being a member-borrower of Farm Credit can be beneficial for you, call us at 888.339.3334 today! Co·op·er·a·tive noun An enterprise or organization owned by and operated for the benefit of those using its services. When you work with Farm Credit, you’re not just a customer. You become part of a community, and have a voice in how we operate as an association. Give us a call today to learn more about the many benefits of a Farm Credit membership. If you’re looking for a small farm with nearly 1,000 feet of road frontage for possible lots, look no further. Approximately seven acres tillable with two acres wooded. Barns are sold as-is. $179,900. Purchase your dream land on 18 wooded acres with approved site evaluation for sand mound. Property holds abundant wildlife and has a 1.5 acre food plot in the back left of the property. Property line is to the middle of the tax ditch allowing for easy access around the perimeter of the property. $125,000. Situated on the banks of Comegys Bight on the Chester River, this 51.55 acre farm compound is often referred to as Camelot. The location of the main house, three cottages, in-ground pool and pool house in the critical area buffer make this waterfront property extremely rare.. $2,425,000. Contact Jamie Masten, Masten Realty LLC. 302-422-1850. Contact Wes Cromer, Masten Realty LLC. 302-448-1032. Contact Stacy Kendall, Cross Street Realtors. 443-480-3453. This is a unique opportunity to own more than 32 acres on Maryland’s upper Eastern Shore. Nestled between Ponds Creek and the Chesapeake Bay, this is a rolling site with a pond and 1,400 feet of water frontage. Property includes a boat slip which is part of the Community Common Area on the Chesapeake Bay. $749,000. Enjoy this beautiful stone rancher with a red terracotta tile roof on 1.4 acres in Fair Hill, Maryland near to the Fair Hill Natural Resource Management Area. House is well maintained with many recent upgrades. $314,900. Check out this historic Frederick County manor house, circa 1800, largely and lovingly restored. Situated on 6.2 acres with four acres in woods on the scenic Middle Creek. Elegant center hall with authentic details throughout and generously proportioned rooms. As-is condition. $485,000. Contact Joseph A. Zang III, Coldwell Banker Chesapeake. 410 885 2200. Contact Marion P. Bagnal, Harlan C Williams Co. 302-588-7108. Contact Margaret Lamberton, Harry Lamberton Real Estate. 202 422 7200. Contact Deb Bargeski, ReMax Plus. 301-748-6719. Check out this beautiful farm for sale on 172 acres in the Beaver Creek area! Featuring an 1809 limestone farmhouse, bank barn, spring house, smoke house, garage, spring/stream, and mountain and pastoral views. The property has potential for cell tower income, subdivisions, 120 acres of crops and pasture, and 40 acres of woods. $1,395,000. Contact Shirley Bayer, RE/MAX Achievers. 301-573-0827. Call Farm Credit at 888.339.3334. *	Financing availability subject to loan approval and property eligibility. Calling all horse lovers and trainers! Check out this 84 acre horse training and boarding farm, improved by a 54 stall stable with a 220’ x 83’ foot indoor and a 300’ x 100’ lighted outdoor arena. On the eastern edge of the AR zone that now allows on-farm breweries, distilleries, or wineries. The farm can be subdivided into two parcels. $2,300,000. Located just minutes from Route 340, this 158 acre property is a great investment and location for a farm market and commuters. Own this operating farmette with a main house and rentable tenant property. Includes a bank barn, dairy barn, loafing shed, additional buildings, and a stream. $1,650,000. Don’t miss out on this 100 acre piece of land in Salisbury, Maryland! Approximately 35 acres of farmland and 26 acres of timber, this property has great exposure with 2,100 feet of road frontage, a pond in the back, and planted power lines. Subject to subdivision. $290,000. Contact Sue Kelley, Kelley Real Estate Professionals. 240-674-1089. Contact Tom Ruch, Adventure Group of Long & Foster. 443-235-1347. Build your dream home on eight cleared acres near the Howard County line with gorgeous views and a tranquil setting. Only five minutes from I-70, the land is zoned ag. The barn has original stone foundation and needs some work. Perc requires validation, well/septic requires verification. Existing house is sold as-is. $369,000. This 8.6 acre Lancaster County farmette offers plenty of room to stretch out and raise animals. Including a detached two-car garage, implement shed, barn with a loft, and a shed. The two-story home features wood floors, wide baseboard trim, transom windows, a front porch, and balcony. $362,000. A beautiful panoramic estate setting on 41 acres adjoins Patuxent State Park in Howard County. Perfect for horse lovers with riding trails nearby, the property features a 4,110 square foot 2.5 story farmhouse, 40 x 40’ equipment building, small barn, 18 acre meadow, 23 acre mature woodland with stream, and the possibility to subdivide up to four lots. $1,150,000. Contact Garry Haines, Haines Realty. 410-876-1616. Contact Stephen J Ferrandi, Maryland Land Advisors. 866-910-5263. Contact Cheryl A. Fuss, Gateway Realty, Inc. 717-587-2046. A five-star equestrian center located in beautiful Bucks County. Property includes a fieldstone farmhouse on 40.47 acres of rolling and flat pastures, indoor and outdoor arenas with German Geo Textile footing, a five-stall bank barn, and a trainer’s apartment. $1,795,000. The perfect operating horse farm on nearly 26 acres. Featuring a renovated farmhouse with beautiful wood floors, attached residential rental, horse barn, machine shed, five run-in sheds, 11 paddocks, large lighted and fenced riding ring, bank barn with heated bays, warehouse, stables, and springs and a stream on the property. $749,900. Contact Cindy Stys, Cindy Stys Equestrian & Country Properties, Ltd. 610-849-1790. Contact Dave Simpson, Suburban Realty. 717-269-6688. This magnificent property has been in the family for decades. The land encompasses over 180 acres of countryside, offering peace and privacy. Includes a pond, pole barn, and spring house. A 1780s stone farmhouse presides over the property, preserving many of the home’s original features. $1,500,000. Don’t miss the views from every window of this newly renovated brick Cape Cod. Sunlight pours onto the refinished oak flooring. The house sits on one parcel and the remainder of the land on another parcel for a total of 34 acres, leaving plenty of options to build. The farm is country living at its best. $542,000. Contact Lisa Tiger, Century 21 Gold, 710-207-6186. Contact Melissa Crider, Sager Real Estate. 540-335-1387. WEBSITE RECENTLY? We have given our website a fresh new look to be more user friendly! Highlights of the revamp include: • Easier to navigate with more visuals • Newsroom with updated articles and blog posts • Videos on webpages with customer testimonials • Contact forms that make it easier to get in touch with us Check it out for yourself at mafc.com. Protect Your Investment We know that farming is a risky business. Crop insurance mitigates that risk and protects you from major loss. Give us a call today to discuss your crop insurance options. Cooperatives around the world operate according to the same set of core principles and values, adopted by the International Co-operative Alliance. Cooperatives trace the roots of these principles to the first modern cooperative founded in Rochdale, England in 1844. These principles are a key reason that America’s financial cooperatives operate differently from other financial institutions, by putting the needs of their members first. 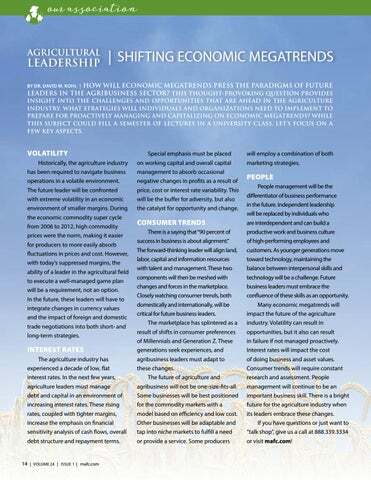 HOW WILL ECONOMIC MEGATRENDS PRESS THE PARADIGMS OF FUTURE LEADERS IN THE AGRIBUSINESS SECTOR? THIS THOUGHT-PROVOKING QUESTION PROVIDES INSIGHT INTO THE CHALLENGES AND OPPORTUNITIES THAT ARE AHEAD IN THE AGRICULTURE INDUSTRY. WHAT STRATEGIES WILL INDIVIDUALS AND ORGANIZATIONS NEED TO IMPLEMENT TO PREPARE FOR PROACTIVELY MANAGING AND CAPITALIZING ON ECONOMIC MEGATRENDS? WHILE THIS SUBJECT COULD FILL A SEMESTER OF LECTURES IN A UNIVERSITY CLASS, LET’S FOCUS ON A FEW KEY ASPECTS. From Winchester, Virginia, we feature board member Joe Snapp. The Snapp family owns and operates West Oaks Farm, a diverse operation growing fruit, row crops, and Angus cattle. Jenny Rhodes, the current Chair of our board, operates both a poultry and grain operation in Centreville, Maryland. Jenny grew up immersed in agriculture at a time when young women were not often seen in the field. Paul Baumgardner of Emmitsburg, Maryland joined our board in 2005. 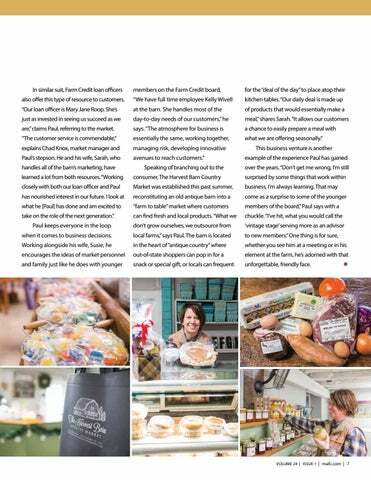 Paul and his family opened Harvest Barn Country Market last year after running dairy, hay, beef and produce operations. From the Penn region, we feature Brian Boyd, Vice Chairman of our Board. Brian owns and operates a poultry operation and custom planting enterprise in Lebanon, Pennsylvania. 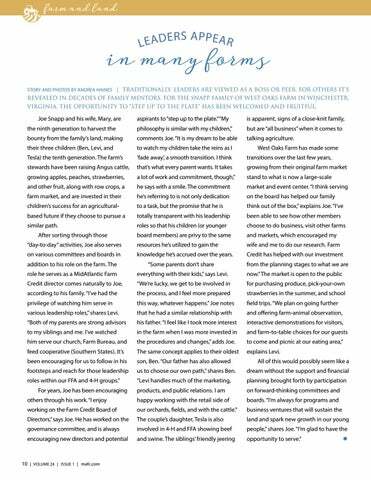 A message from our CEO, Tom Truitt, about how Farm Credit's cooperative structure makes our association unique.